National Bank was established in 1841 and became the first bank in the modern Greek state, with a decisive contribution to the financial life during these 170 years of history. Nowadays, National Bank leads one of the largest and strongest financial groups in Greece, with a strong presence in Southeast Europe and Eastern Mediterranean. National Bank offers a broad range of financial products and services that meet the ever changing needs of businesses and individuals. It would be fair to describe it as the Bank of the Greek family, since it controls the ¼ of retail banking and has 25% market share in deposits. The share of deposits reflects the confidence of the savings customers, which are its driving force. With 528 branches and 1,432 ATMs, it has an extensive service network covering the entire geographical area of Greece, while at the same time it is developing alternative distribution channels for its products, such as the Mobile and Internet Banking services. Today, the network of the Bank abroad includes 1,204 units, while the Group employs 34,554 employees, serving a market of 125 million residents (data as of 30.09.2015). The Act4Greece program is a pioneering initiative for the promotion of social and developmental banking. It aims at generating financial support for projects in the fields of welfare, health and social solidarity, the social economy and entrepreneurship, culture and cultural entrepreneurship, environment and sustainability, research, education and training, young and innovative entrepreneurship and sports. One of its key aims is to broaden and channel – with absolute transparency and accountability – resources from the length and breadth of the world to actions which, under the current conditions of crisis, meet the real needs of Greek society and support pioneering and innovative ideas. Act4Greece is supported by National Bank of Greece in strategic cooperation with organizations and foundations of international standing, such as the John S. Latsis Foundation, the Bodossaki Foundation, the Alexandros S. Onassis Foundation, the Hellenic National Commission for UNESCO, and the Hellenic Network for Corporate Social Responsibility. The various Act4Greece actions are being implemented by bodies with a solid track record in such activity, through the program’s website www.act4greece.gr, by leveraging the potential of the crowdfunding financing model. Act4Greece aims at gradually covering all types of crowdfunding participation, i.e. leveraging the potential to raise funds through donations, through lending, and through equity participation, as soon as the appropriate institutional framework has been adopted. The specific choice of areas was made on the basis of current conditions in Greek society and the economy, and aims at enhancing awareness and broadening public participation in supporting collective social and developmental actions and at highlighting the value of contributing and showing solidarity. 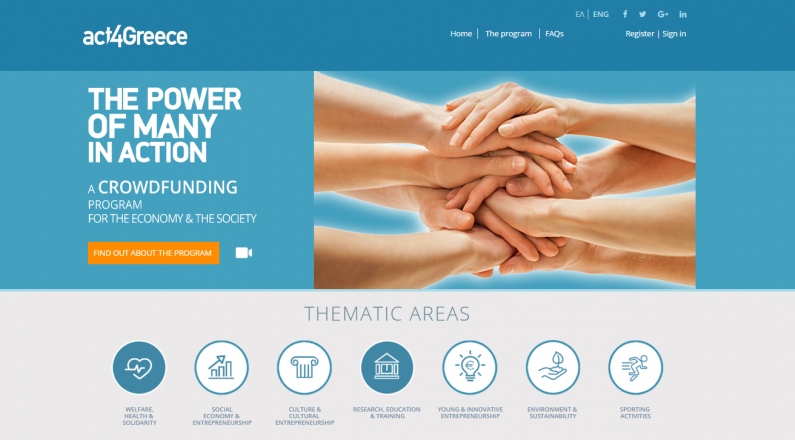 Crowdpolicy designed and developed the act4greece CrowFunding / CrowdDonation Platform, based on the latest technological trends and tools for CrowdFunding Initiatives. Through the platform individuals or legal entities, businesses or organisations, can offer support to one or more actions of the program by debiting their credit or debit card, or by effecting a deposit or wire transfer to the account of the action they are interested in at the branches and e-banking of all banks. Furthermore, NGOs and Institutions can also offer support in kind or services, in the context of a CrowdResourcing Approach.